Despite the traffic, our first impression of Wellington was a good one. It was clearly visible that it’s a student’s city with lots of modern buildings, and yet there we saw beautiful old buildings as well. The overall atmosphere was inviting. We drove to our friend Julia’s house. We had met Julia and her brother Tim in South Africa, at the Wild Coast, where we celebrated New Year’s Eve together. Now, Julia had invited us to stay with her during our time in Wellington. Lea is just like us and doesn’t really like cities. Especially after weeks spent out in the wilderness, the noise and people were too much for all of us. So, we mostly stayed inside, chilling with Julia and her friends. 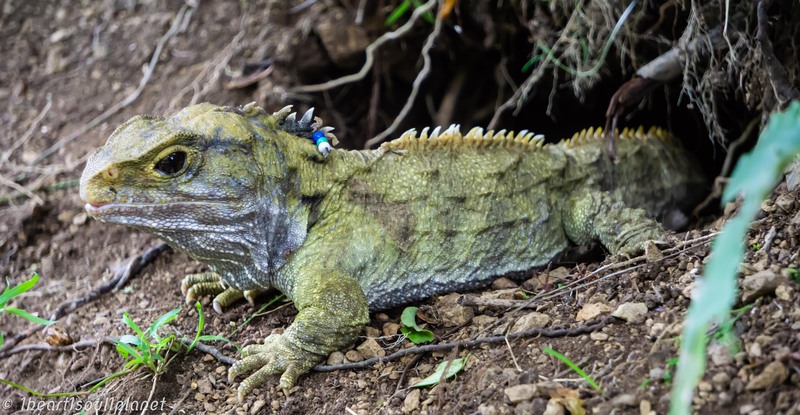 We did, however, go to Zealandia, hoping to fulfill Lea’s wish of seeing Tuataras. The day spent in Zealandia was a nice one and we saw many Tuataras amongst other animals. 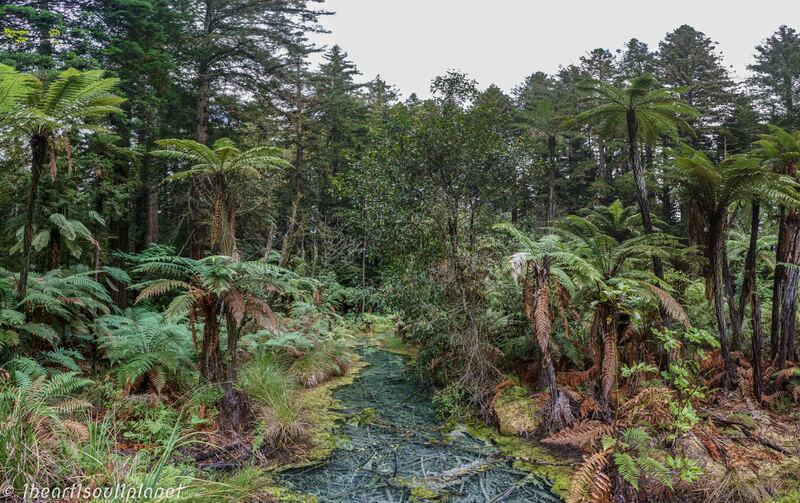 However, we don’t really know what to think of Zealandia and other “Conservation projects” in New Zealand. A couple hundred years ago, stupid settlers brought a bunch of mammals to Australia and New Zealand. The mammals, such as mice, possums and rabbits; soon began to spread and most of New Zealand’s bird species went extinct. Now, New Zealand is literally waging a war against these mammals. Well, you might think that’s understandable, but the thing is: The damage is already done, so what they’re doing now seems too little too late, right? Also, they lay out poison in forests everywhere (same in Australia). Those are dangerous for dogs as well. The goal is to poison possums, rats and mice, who eat birds’ eggs- like Kiwi eggs, for example. While we do agree that species going extinct is a shame, we feel more compassionate about a specific animal. A species is nothing but a name, but it’s not a creature who feels pain. An egg doesn’t have feelings. A possum does. New Zealand even encourages its citizens to take part in the war against mammals, by shooting or poisoning them themselves. In our opinion, this is sick and absolutely disgusting and also hypocrisy at its finest. Kill thousands of mammals to save the eggs of a bird? No, thank you. 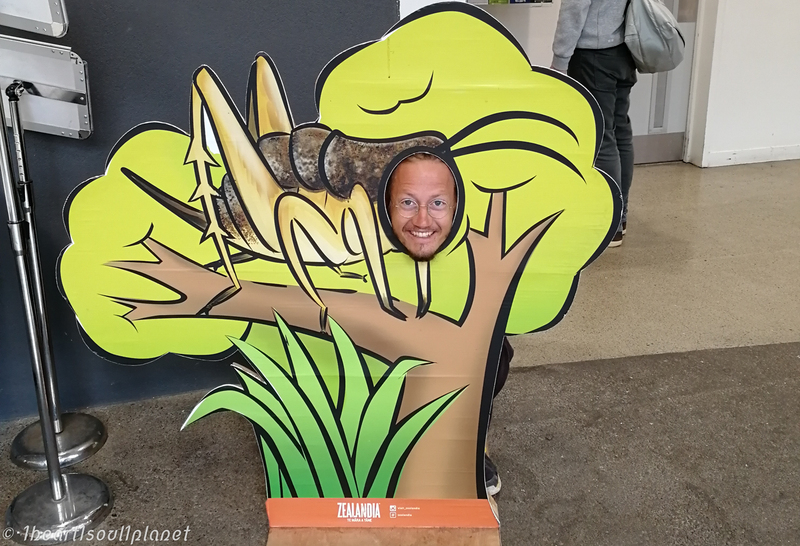 Anyway, since the money donated to bird conservations projects goes directly into the possum hunt, we ended up not donating anything and we felt bad about visiting Zealandia in the first place. Even though Wellington is a very nice city, we were glad when we headed out and back into nature. 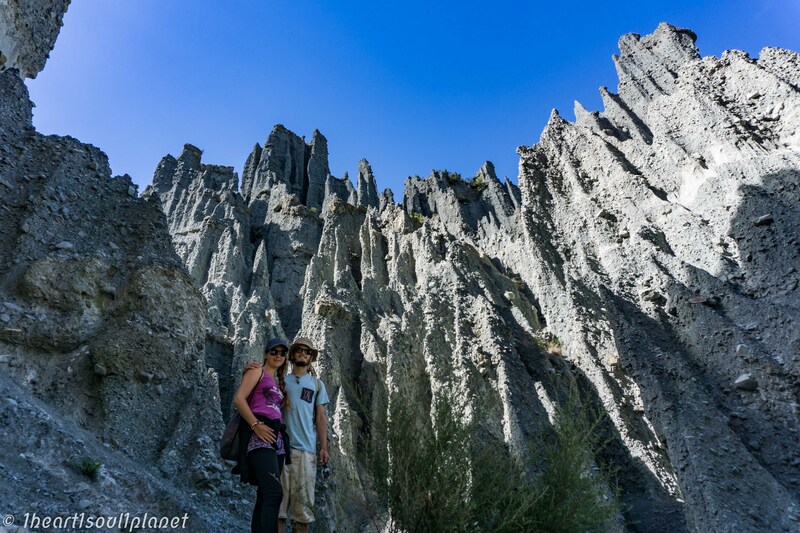 Our first stop were the Putangirua Pinnacles- another Lord of the rings filming site. The campsite here was really nice, but windy as hell and cold. The campground was near the beach and right next to an almost dried out river bed. After a belly-warming dinner and a good night’s sleep, we headed out for a hike and to explore the area. Our next stop was a free campsite on a beautiful meadow in a forest. 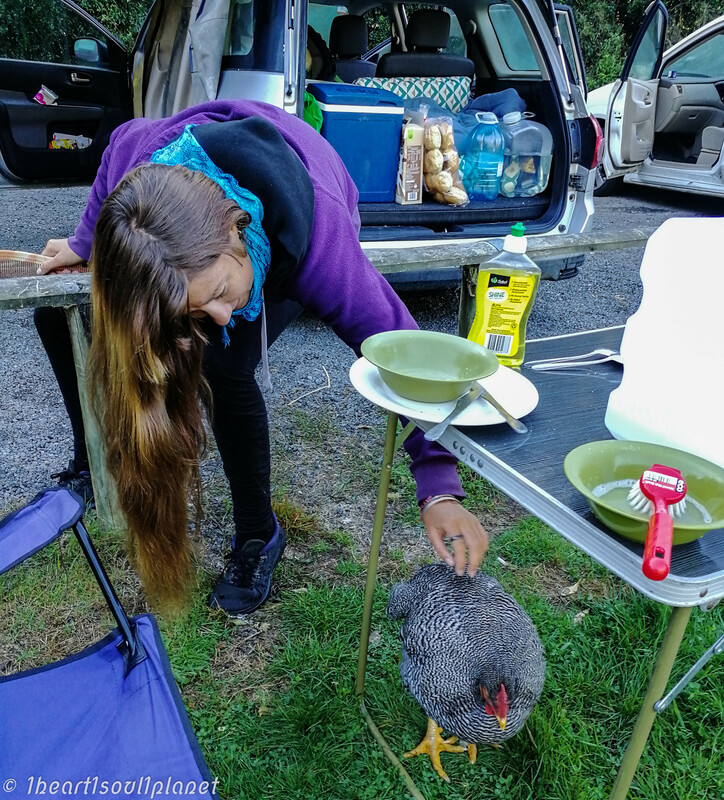 There wasn’t anything interesting to do, but we had read the reviews of this campsite online and everyone said there were annoying chickens who tried to steal your food. Mount Doom was calling us! But before we dared this challenging hike, we had to choose between a couple of free campsites nearby. We chose Urchin Campground- again on a beautiful meadow. It didn’t have any running water, but there was a river nearby and a beautiful hiking trail with a rather funny name: Tree Trunk Gorge Track. It took us several tries until we were able to pronounce it correctly. The cool water of the river replaced a needed shower and served also for our alimentation- though we had to cook it before we could drink it. And after a great night’s sleep on Urchin Campground, we got up early in the morning and made our way to the parking lot near the Tongariro Alpine Crossing. There, we left Hanni behind and started the trail. 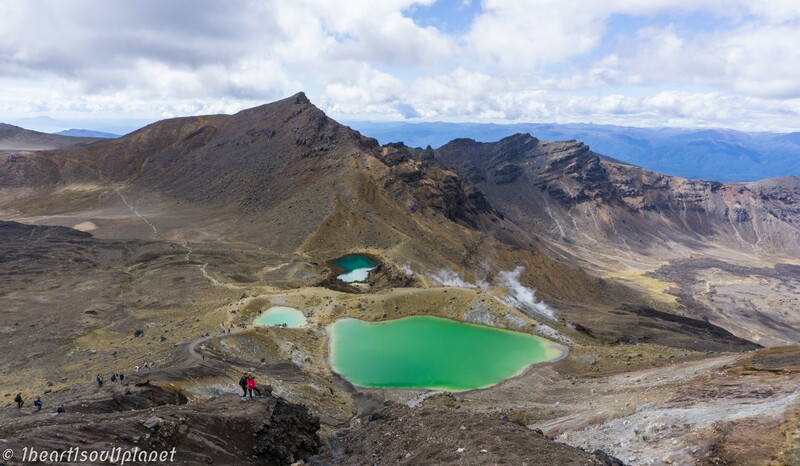 The Tongariro Alpine Crossing is a Must-Do for everybody who visits New Zealand- and especially for Lord of the rings fans. 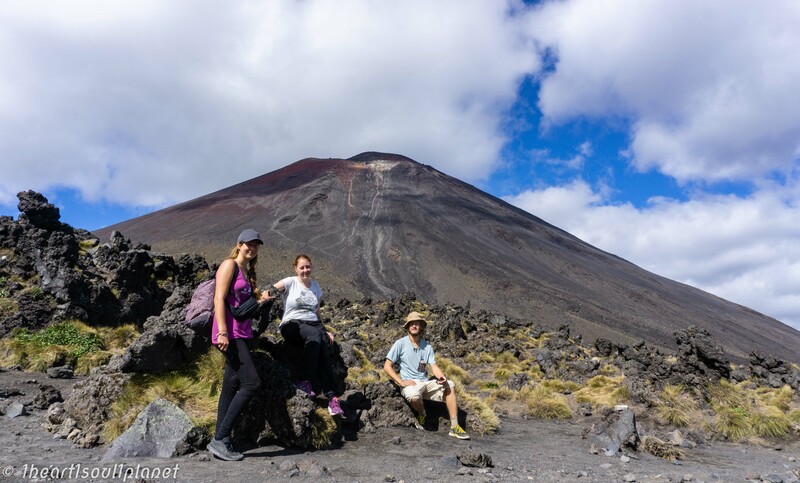 The trail leads through beautiful volcanic landscapes and past Mount Ngauruhoe, better known as Mount Doom (the volcano where Frodo destroys the ring). 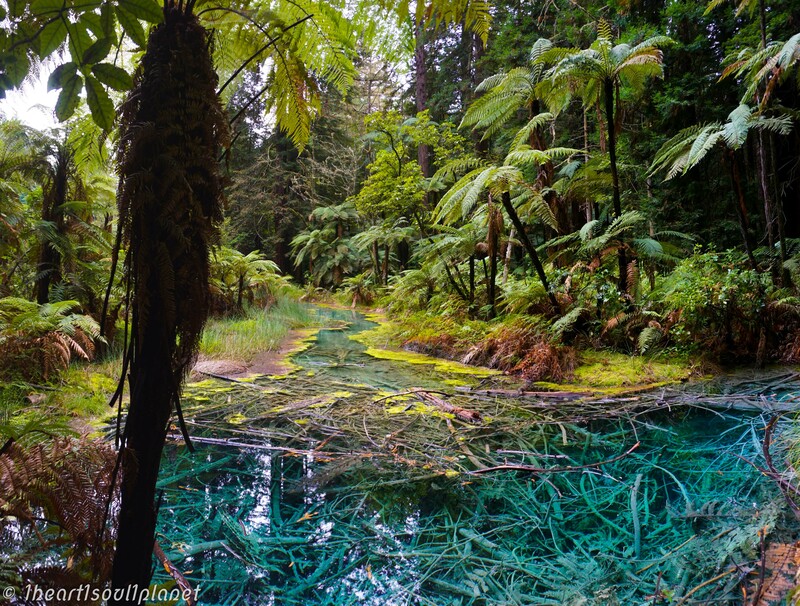 Seen as it’s one of the most spectacular things to do in New Zealand, the trail was filled with people. We stayed focused though and kept our own pace, taking in our beautiful surroundings. Some people walk the whole Alpine Crossing and descend on the other side. We only hiked to the Emerald Lakes, where we enjoyed lunch before taking the same way back that we had come. After all, we needed to pick up Hanni. There aren’t really words to describe the beauty of the landscape and the Emerald Lakes… but that’s what pictures are for. After all that hiking and drinking river water, we treated ourselves to some luxury. 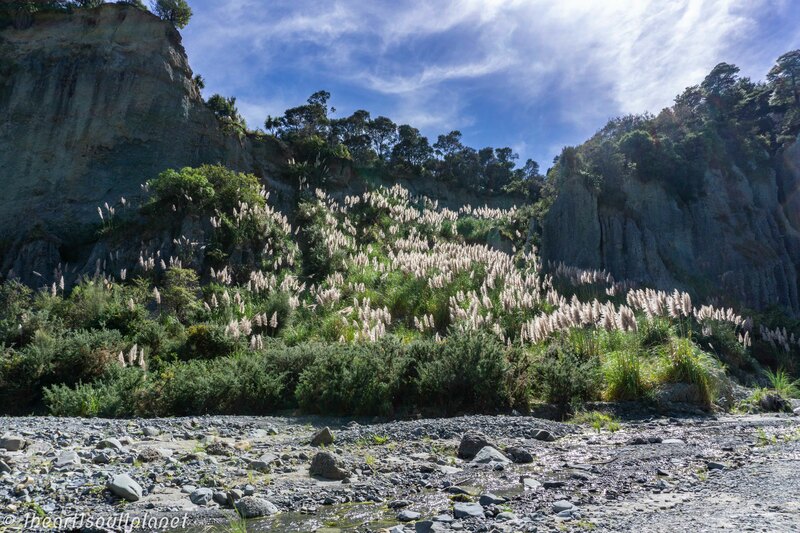 The Waikite Valley is where several Hot Springs can be found. 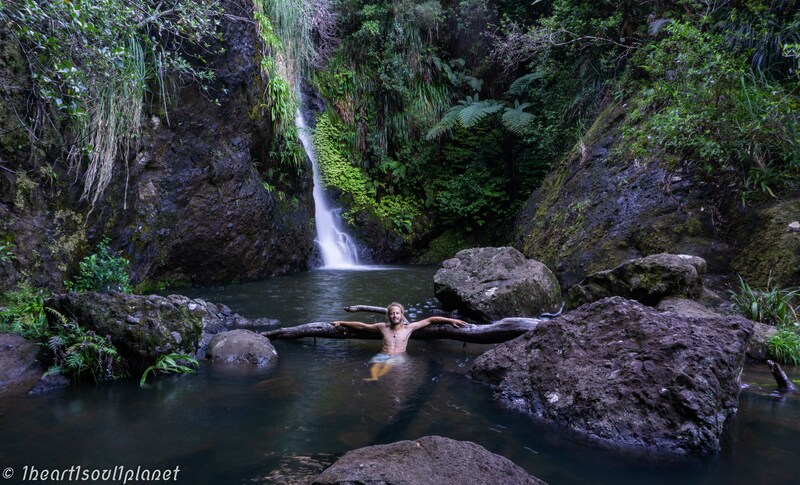 We booked a night on a campsite, which included access to thermal pools. Needless to say, we spent hours soaking in those pools and afterwards, we enjoyed the luxury of a real shower. The next morning, we got up early to enjoy the pools again, before continuing our trip. 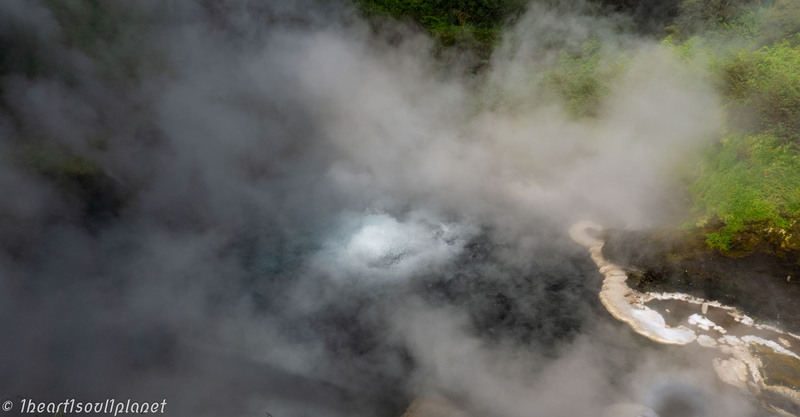 Rotorua is a very touristic town and we had planned to do a lot here, but most activities weren’t really suitable for us. I mean, sure we’d like to try ziplining or climbing etc., but we didn’t really feel like spending hundreds of dollars for something like that. 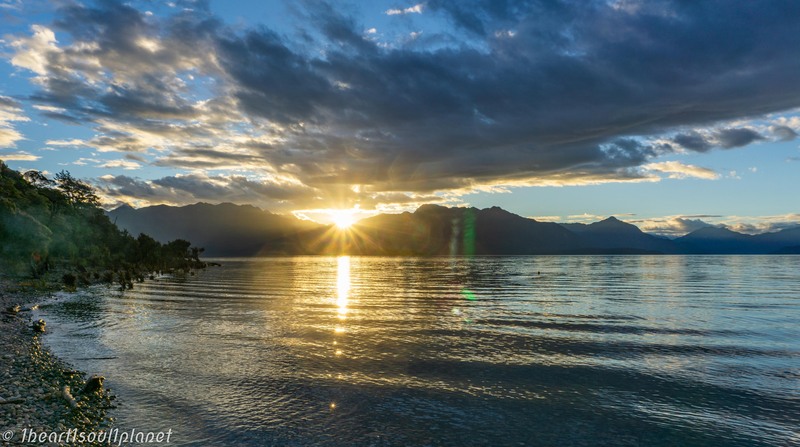 I know I’m repeating myself- but Whakamaru Camping Ground was another breathtakingly beautiful spot. 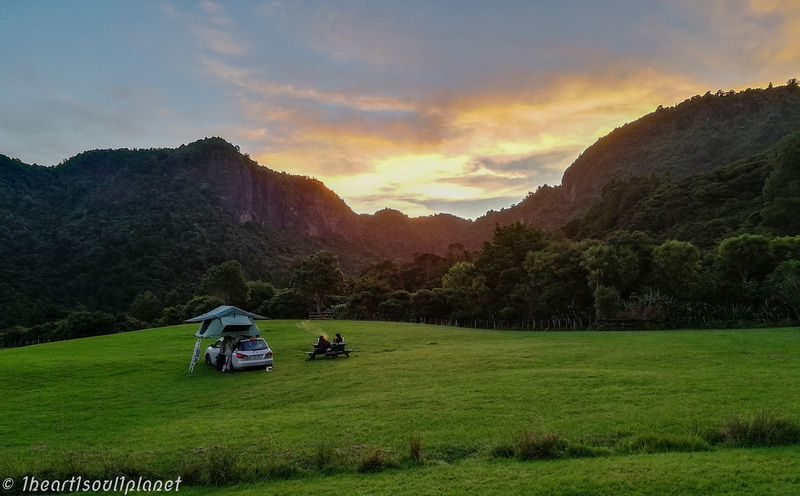 New Zealand’s campsites are mostly extremely beautiful ones, but every time we found a new one, we were amazed nonetheless. This one was quite big, so we enjoyed some privacy and watched the sun go down over the lake. 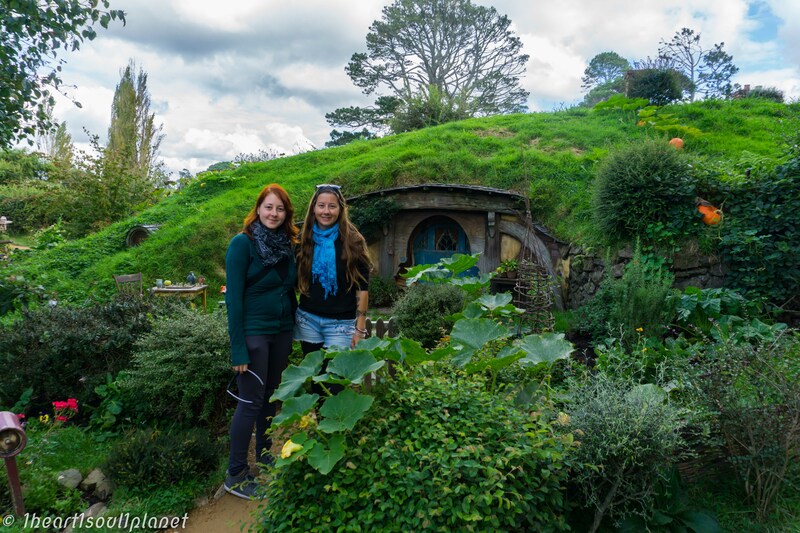 Another Must-Do in New Zealand (for Lotr-fans) is the Hobbiton movie set. René and Lea weren’t that excited to see it, because it was probably the most touristic thing we’d ever do and it was quite expensive. But it was Nici’s number one wish for this trip, so they gave in and we did it. There were lots and lots of people waiting, but the buses to the movie set left quite frequently and our group was a good one, without noisy children. 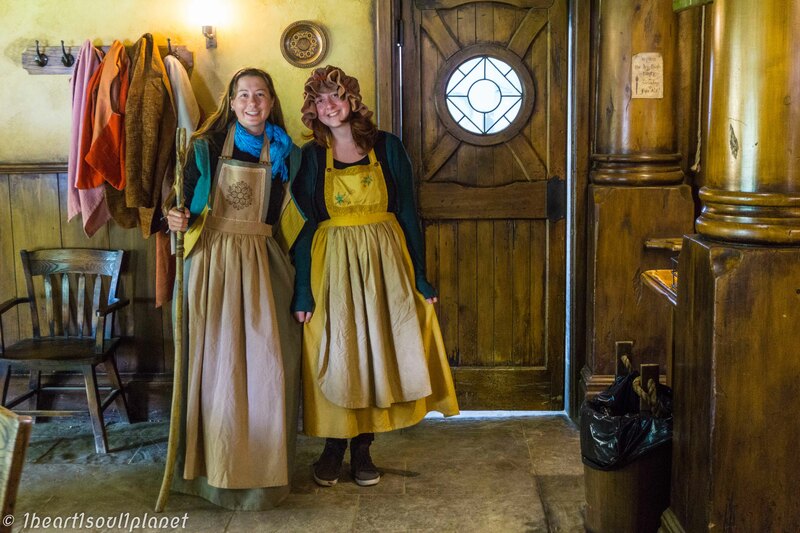 A woman dressed like a hobbit was our guide. She led us through the Shire, past hobbit holes and a real vegetable garden and despite the amount of people, the place felt magic. 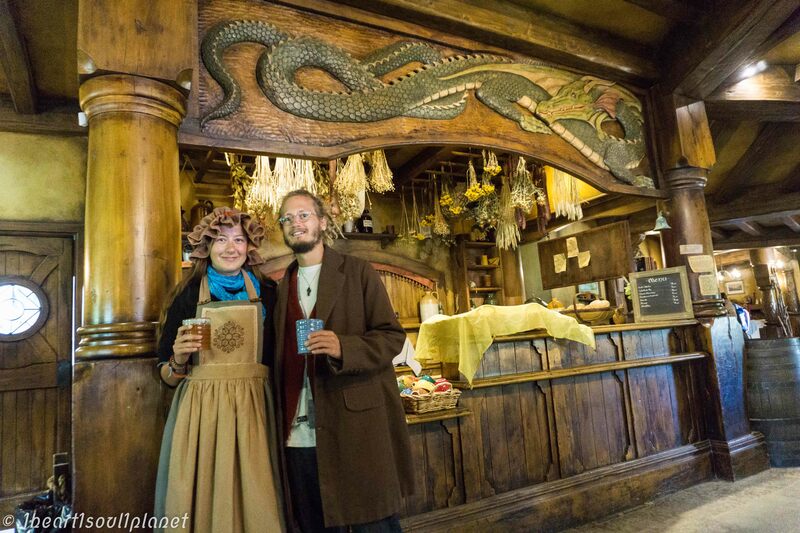 When the tour was over, we drank a free beer in the Green Dragon and dressed up as hobbits. 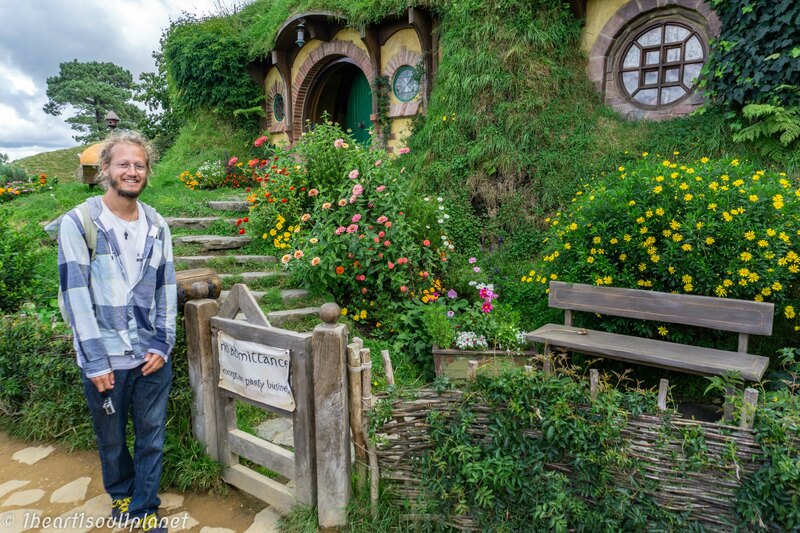 Afterwards, we all were equally happy to have done the Hobbiton Movie Set tour. That night, we stayed again on Whakamaru Camping Ground. The weather had gotten worse again and it was raining quite a lot, when we drove on. We had a long way to go, since the beach was calling again. We wanted to spend a night or two on Whatipu Beach, but the road was flooded. Four wheel drives with high clearance managed it alright, but the risk of our Hanni getting flushed into the sea was too big. 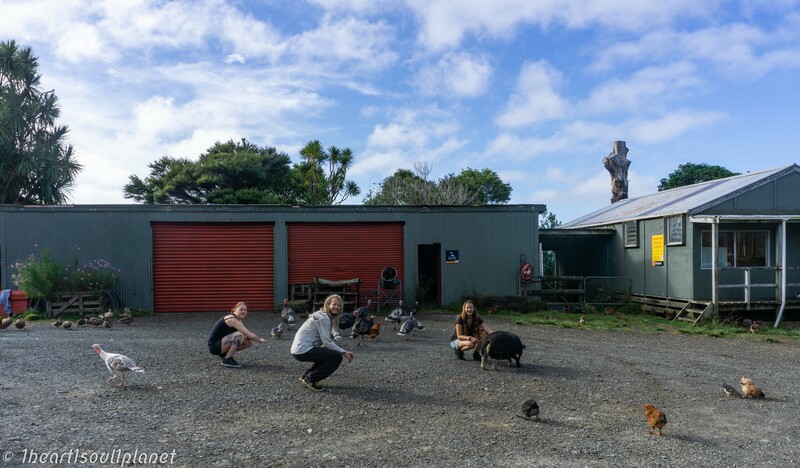 A herd of turkeys, chickens, ducks and a pig rushed towards us, as soon as we parked Hanni in front of the barn. For animal-lovers like us, this place was a paradise! 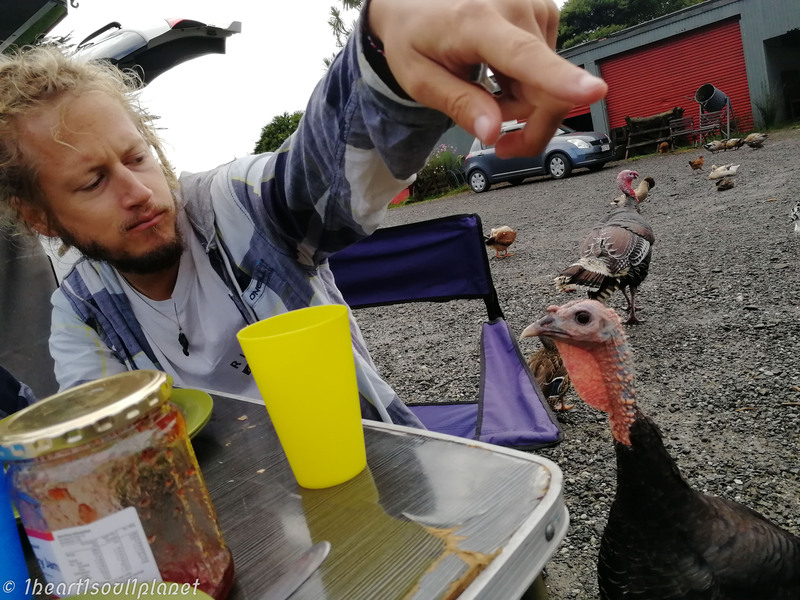 But eating breakfast the next morning proved to be tricky, since the turkeys and the pig appeared to be very hungry. Since the road to the beach was now clear, Lea and René then took a nice long walk, while Nici spent the afternoon reading on the beach. Of course, we spent our last night camping on the farm again, with the animals. In the evening, while Nici cooked a nice dinner, Lea and René also went on another hike to a close by (3,5 km) waterfall. And then the sad day was here. Our road trip was officially over. 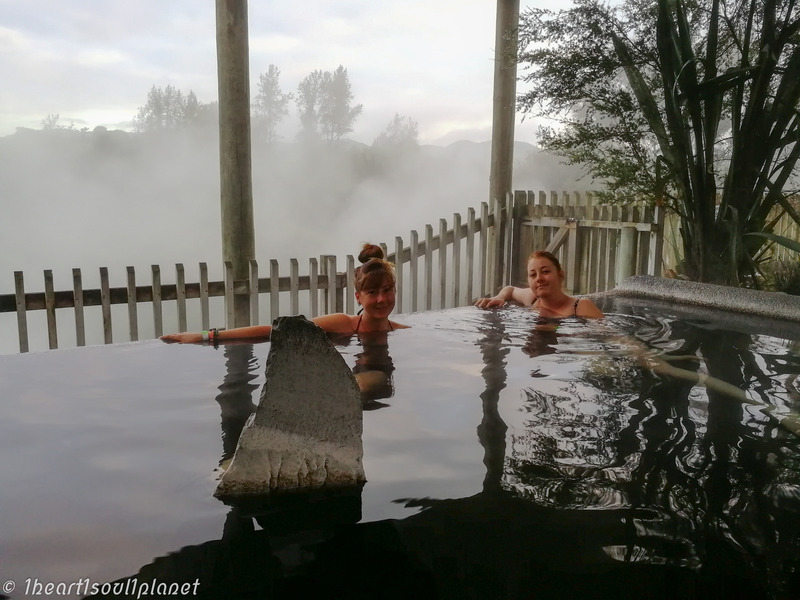 We had booked an Airbnb in Auckland and after giving Hanni a bath and returning her to Wicked Campers, we enjoyed the luxury of soft beds, showers and Wi-Fi. 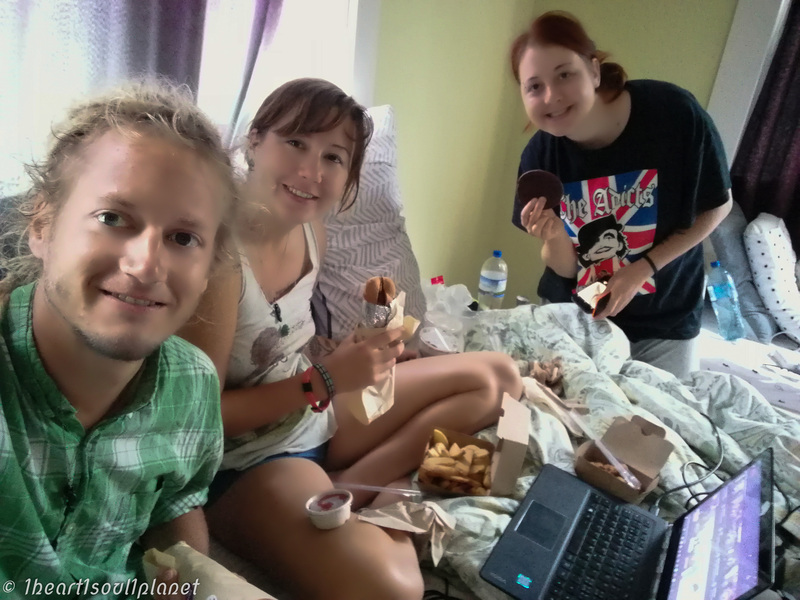 Auckland proved to be a paradise for vegan fast food and since we aren’t fond of cities, we used Uber Eats to have the food delivered. We did however, meet up with Tim (Julia’s brother) to get some beer and burgers. Way too soon, the day of our departure arrived.